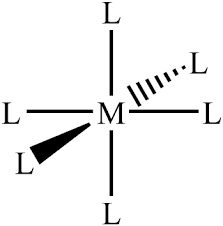 In a free metal cation all the five d-orbitals are degenerate(i.e.these have the same energy.In octahedral complex say [ML6]n+the metal cation is placed at the center of the octahedron and the six ligands are at the six corners. These six corners are directed along the cartesian coordinates i.e. along the x, y, and z-axis. When all the ligands are at an infinite distance from the metal cation, the five d-orbital of the metal cation will not be affected by the ligand electrostatic field and will remain degenerate. When the ligands move towards the metal cation, there are two electrostatic forces i.e. Greater the repulsion between metal cation and ligands, ligands will be more closer to the metal cation and hence more will be the repulsion between the metal d-electrons and the lone pair of electrons on the ligand. When the ligands are closer to the metal cation an electrostatic force of repulsion also exists among the ligands.These two repulsion cause to adopt the octahedral geometry that locates the ligand at the internuclear distance from the metal cation and as far apart from one another as possible. The force of repulsion between metal d-electron and the ligand electrons cause to increase in potential energy of metal d-electrons. Remember that greater the force of repulsion higher will be the potential energy. If all the six ligands approaching the metal cation surrounds it spherically symmetric i.e. all the six ligands are at equal distance from each of the d-orbitals. The energy of each d-orbital will raised by the same amount and all the five d-orbital will remain degenerate. This is a hypothetical situation and has the average energy of a set of d-orbitals.In an actual octahedral complex, a spherically symmetric field is never obtained. Therefore all the five d-orbitals are not affected by the same extent. Since the two d-orbitals( dx2-y2 and dz2 ) points directly towards the ligands and the three d- orbitals( dxy ,dyz and dzx ) point in between the path of the approaching ligand. Therefore the dx2-y2 and dz2 orbitals will be more strongly repelled than the dxy ,dyz and dzx orbitals. Therefore the energy of the dx2-y2 and dz2 orbitals will be raised and that of the other three orbitals which lie far away from the ligand will be decreased relative to the hypothetical energy state. The five d-orbital which were degenerate in a free metal cation is now split into two sets of d-orbitals of different energies, a higher energy level with two orbitals(dx2-y2 and dz2)having the same energy and a lower level with three equal energy orbitals(dxy,dyz, and dzx). The set of dx2-y2 and dz2orbitals are referred to as eg set which is doubly degenerate and the set of dxy,dyz, and dzx is referred to as t2g set which is triply degenerate. Since the distance between metal cation and the ligands has remained the same, the net potential energy(or average energy) of the system must remain the same as that of the spherical field before splitting. This state of average energy is called the barycentre. The separation of five d-orbitals of metal cation into two sets of different energies is called crystal field splitting. The energy difference between two sets of orbitals which arise from an octahedral field is measured in terms of the parameter ∆0 or 10Dq where o in ∆0 stands for octahedral. Since the energy of barycentre remains constant, the total energy decrease of the t2g set must be equal to the total energy increase of the eg set. Therefore since there are two eg orbitals, they must increase by 0.6∆0 or 6Dq and the three t2g orbitals must decrease by 0.4∆0 or 4Dq per electron. The decreased energy t2g of orbitals stabilizes the complex by 0.4∆0 and the increase in energy of eg orbitals destabilizes the complex by 0.6∆0.